Some days, it's hard for me to think my baby is 5 years old. Of course, she's been five for a couple months now, but it is still hard for me to believe. Luckily (?) for me, I'm too busy to think about it most days, but when I do, it is with great disbelief. Emma's birthday fell on Memorial Day this year, but we opted to celebrate the Sunday after since so many of her friends already had family engagements. I wanted this to be a great day for her! And maybe for me, too. 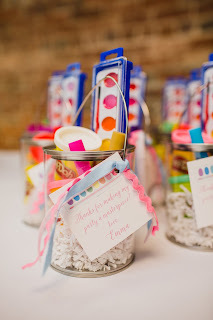 I LOVE to host a great party, but with my own business and two kids, I really only get to do that twice a year anymore: for their birthdays. So I wanted to do this one up right! 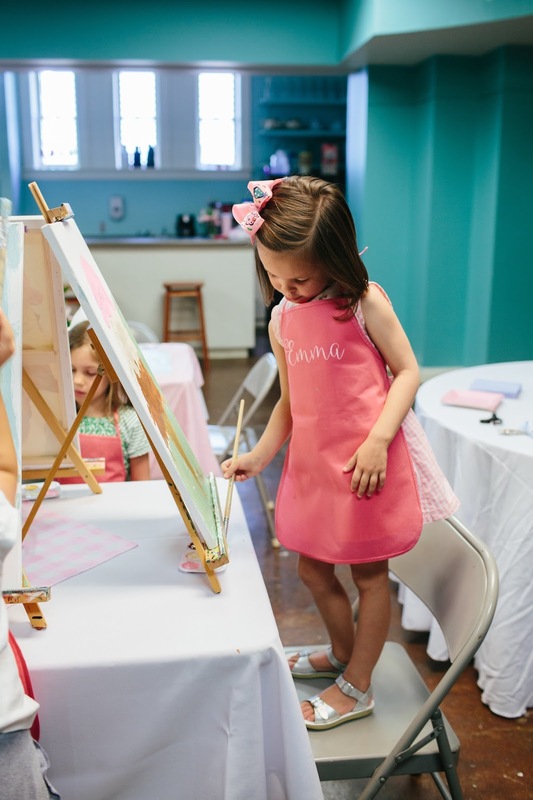 In the past year, Emma has become quite the little artist, so when it came time to plan her birthday party, I knew exactly what I wanted to do. I contacted the very talented (and so adorable) Tiffany Brightwell to teach Emma and 9 of her closest friends (and her little brother!) to paint an ice cream cone on canvas. We held the party in the basement of the Carnegie Visual Arts Center. 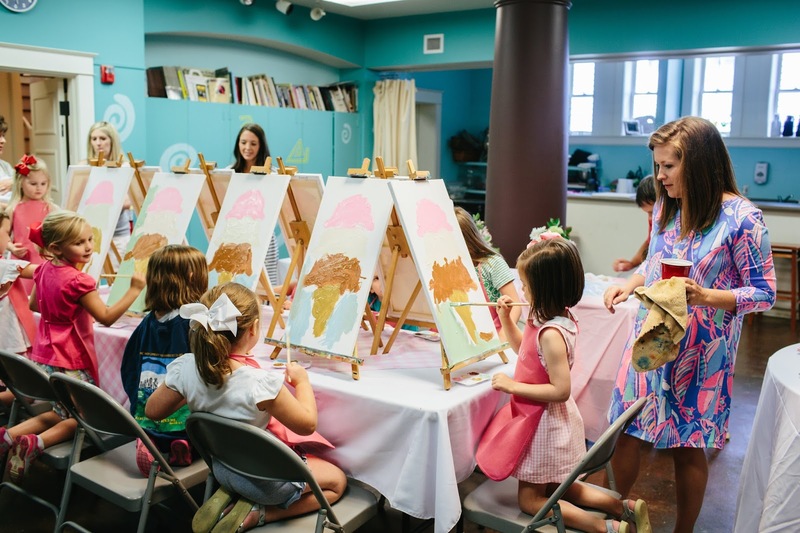 I think it really set the scene for our budding artists! 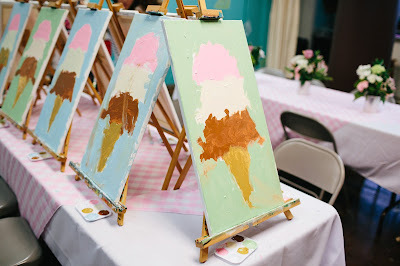 Before the girls arrived, Tiffany had pre-drawn the ice cream cone on each canvas so that the children would have a template to paint. 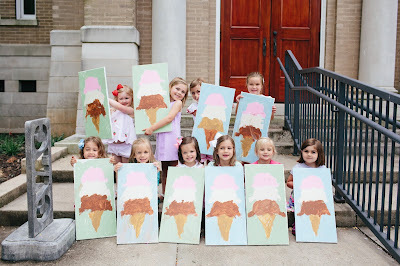 She instructed them to start with one color at a time, starting with the top scoop, then middle, bottom scoop, cone, and finally background. Of course, we couldn't leave Baby Sage out of all the fun! However, we didn't think he was quite up to the other girls' level, so we gave him a blank canvas and let him have fun. And have fun he did! However, I'd put his masterpiece more in the "abstract" category. 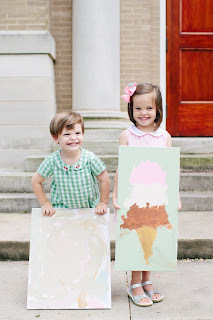 I think we'll call it "Melted Ice Cream." 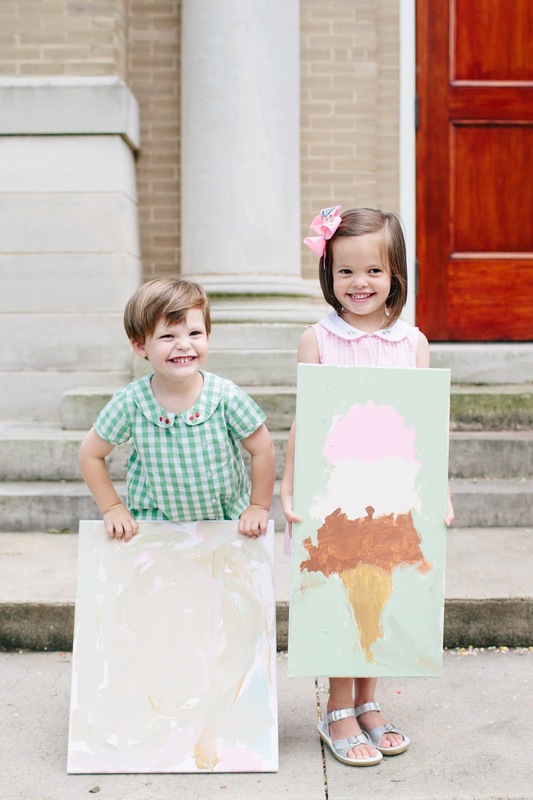 When the kids were done with their paintings, we left them to dry while they ate cake. 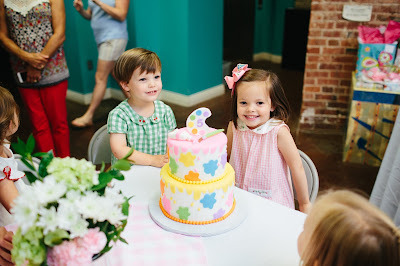 We returned to the amazing Crazy Daisy Cakes out of Hartselle again this year. We loved them so much last year (http://blog.shopcloud9.com/2016/06/turning-four-on-farm.html) we had to go back! I'm pretty sure that was the right decision, because I have never seen little girls eat so much cake! If we thought we loved it last year, I'm pretty sure it was even more loved this year! And best of all - no tears out of Emma this year! She has really grown up in the past year, and didn't mind one bit when her friends sang happy birthday. She even blew out all five candles! 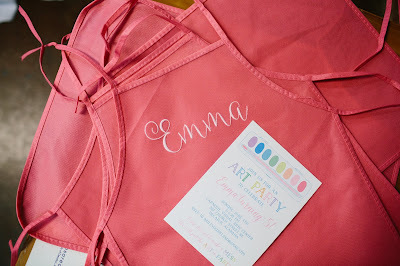 When we were done with cake, Emma went to open her gifts. Baby Sage might have gotten a little confused at this point, thinking some of those gifts were his. To his credit, he gave Emma all the gifts to open - but was calling them "our gifts" and handing them to her so fast she couldn't keep up! She really received some precious gifts, and so far is sharing them well with her brother. We finished the party with each guest holding their masterpieces outside on the steps of the Carnegie for us to take a group photo. 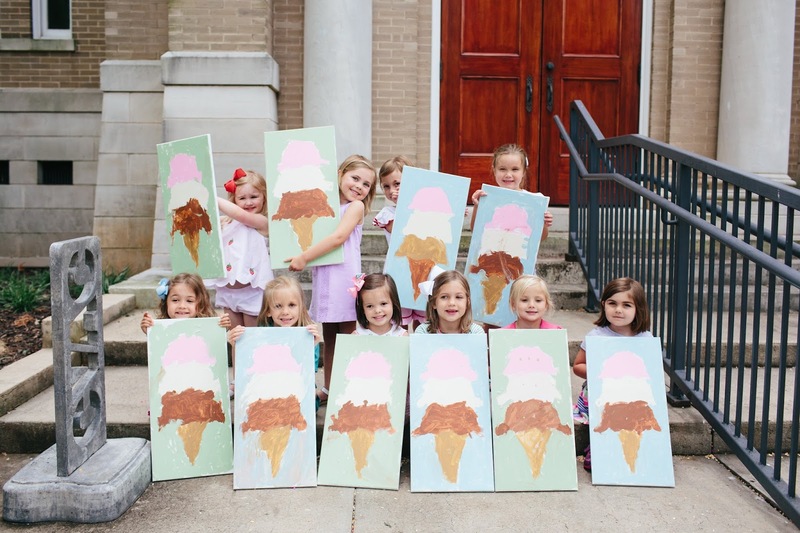 Not every painting was dry, but the adults did a great job moving the girls and their paintings outside without messing anything up. And hey, those pink aprons we handed out at the beginning of the party to guarantee no one got paint on their pretty party clothes may have helped a bit, too! 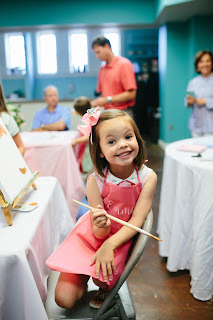 Everyone left with their work of art, a paint can full of new art supplies, and of course, that pink apron. We had the best time celebrating with all our wonderful family and friends!